A word signifying "father," used as a masculine name as early as the time of the Tannaites (see Peah, ii. 6; Yeb. 15a; see following article). 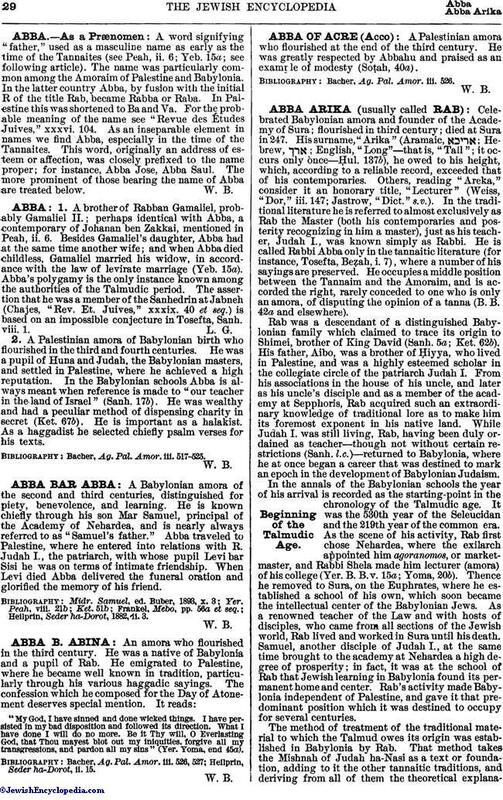 The name was particularly common among the Amoraim of Palestine and Babylonia. In the latter country Abba, by fusion with the initial R of the title Rab, became Rabba or Raba. In Palestine this was shortened to Ba and Va. For the probable meaning of the name see "Revue des Études Juives," xxxvi. 104. As an inseparable element in names we find Abba, especially in the time of the Tannaites. This word, originally an address of esteem or affection, was closely prefixed to the name proper; for instance, Abba Jose, Abba Saul. The more prominent of those bearing the name of Abba are treated below.